Vanquished an evil overlord from the dungeon? It’s time to kick back and commiserate with your adventuring friends in The Red Dragon Inn! In Red Dragon Inn, players take on the role on one of four different adventurers: Fiona, Dierdre, Gerki and Zot with Pooky. Each of these characters has just finished a dungeon delve of epic proportions and it’s time to kick back with a cold one and make some gold in a few friendly games of chance! Each turn, players may take an action in the Inn, buy a drink for one of their pals and must imbibe any drinks that other players have bought them. Every now and then a game of chance will break out where Gold pieces change hands – with the bar wench usually taking her share! You don’t win Red Dragon Inn as much as you try not too lose. But your fellow adventurers, after having your back down in the depth of a dank dungeon, are out to get you. If a character runs out of gold, they lose. If you character’s Fortitude ever drops to a level equal to their Alcohol level, they lose. Last bold adventurer standing is the winner! Each player receives a player mat, two markers, 10 Gold pieces and a character deck. The character deck is shuffled and placed on the “Deck” space of player mat. The red marker is placed on the number 20 on the left side on the board. This is the character’s Fortitude. The Clear marker is placed on the number 0. This is the character’s Alcohol Content. Next shuffle the Drink Deck and place it face down in the middle of the table. Each player then takes one card from the Drink deck and places it face down on the space marked “Drink Me!” Finally players draw seven cards from their character deck to form their starting hand. Choose a starting player and let the game begin! As the title suggests, you may discard any number of cards and draw back up to seven cards. If you have more than seven cards you can just keep them! Here’s where things get cookin! Characters may play one Action card, read its title (which is half the fun), resolve its effect and discard it. Actions in each different character deck have relatively similar effects, but the titles are keyed to each character’s personality or character class. Sometimes Cards: Cleverly titled, these cards can be played… sometimes. Specifically, the card text on the card will state when it can played. Often it’s in response to another character’s Action card or a Drink card that may negate or ignore it. Sometimes, (get it?) you just play them on your own turn. Action cards have many varied effects. Anytime cards: Anytime cards can be played at any time; during your character’s turn, another character’s turn, during any phase and may even interrupt another action. In the Red Dragon Inn, interrupting is common. Gambling cards: Gambling cards are played during your character’s turn, and say either “Gambling,” or “Cheating” under the card title. Playing a Gambling card begins a short “push your luck” sub-game. (Unless you have the “Gambling? I’m in!” expansion). When ever a character plays a “Gambling? I’m in!” card, a round of gambling begins. All players ante one Gold. The next character to the left may pass or play a Gambling or Cheating card from their hand. If they do, they gain control of the round and will win all the anted Gold if they have played the last gambling card. After the round of gambling has ended. The character that started the gambling round gets to continue with their “Buy Drinks” phase. Now, its time for you to toast your fellow adventurers! Flip the top card of your “Drink Me!” pile and apply that drink card’s effects. It could be a refreshing drink like water or coffee. Sometimes it’s a drink that will affect either your Alcohol level or Fortitude. Or it could be a Drink Event that will affect all the characters! Move the corresponding tokens on your player mat and end your turn. And so the game continues. When a character’s Fortitude level meets their Alcohol level, or if a character loses all their gold, that character is out of the game, divides their remaining gold evenly among the remaining players, and site the rest of the game out. The winning character is the last one standing! Easy! The best part of this game are the characters! She and her Goddess are on the Lawful Good side and often heal other characters … for a price. An occasional card can heal Fortitude or lessen the affects of a Drink card, but if anything unseemly goes on… Her Goddess made her do it! Play this when another character plays a Cheating card in a round of Gambling. This negates that card and Dierdre wins the round! Fiona is one of those female warriors that just doesn’t know her own strength, this often costs her friends Fortitude. She is also very proud of her assorted weapons. But can’t seem to keep track of her Gold! This card adds the alcohol content of a Drink card to Fiona’s Fortitude instead of her Alcohol level. A real lifesaver! This Halfling rogue possesses lots cards to turn things to his favor during gambling. And when harmful cards are played on him… wait… where did he go? He was here just a second ago! This card is played when another player wins a round of gambling. Gerki takes all the gold – even if he left the round! Argh! Halflings! Wielding unpredictable spells and an even more unpredictable bunny familiar named Pooky, Zot’s magic is very versatile making needed cards seemingly appear when he needs them. If that doesn’t work, Pooky will go nuts and protect his master. This gives the Drink card Zot is about to drink to any other character. Zot (and Pooky) get to see the card before they teleport it! The artwork by Kennon James and Beth Trott is the main attraction for Red Dragon Inn. The character illustrations are very fun and accentuate the lighthearted atmosphere in which the game was meant to be played. The quality of the components is ok, with some cards warping a bit after some use. But you hardly notice and it doesn’t detract from the game play experience. So easy a Kobold could play it. As fun as the game is, the subject of drinking and gambling is not something that children should be exposed to – even in a fantasy atmosphere. There are tons of other games for families. Try any one of those. 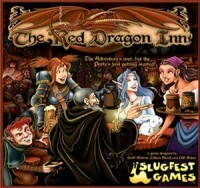 Red Dragon Inn is for 2-4 players, but add expansions and its perfect for large groups! Plays fast, and can be a little cutthroat. Awesome party game! The card play and random aspects of the mechanics are way too unpredictable for a strategic minded gamer. Even with the great card interaction, a strategy gamer will want to chew glass. Skip it. Easy to play, and the different character choices offer the casual gamer great replayability. Perfect game for those that don’t want to invest too much but receive a great game play experience. Avid gamers must have at least heard of this game and if you haven’t tried it yet, take the plunge. Since most avid gamers love expansions, this one will have you dancing on the tabletops. It’s funny, smart with amazing emergent player interaction. Cheers! Too light and frothy for the power gamer who may want a heavier, richer flavored game. Spit it out and move along. Jeff Bottone, Colleen Skadl and Cliff Bohm have designed a timeless classic. The innovation of the two statistical tracks: Alcohol and Fortitude that work together to cause a character’s demise, along with the well-tuned and character specific decks combined with a common deck aspect in the Drink pile, create an amazingly interactive experience based in a generic RPG fantasy realm. Oh, Blah Blah Blah – the game’s a blast! The humor in the game, both visual and written, will appeal to any gamer – unless they have been dead the last 30 years. And it’s a character elimination game that doesn’t really feel like a character elimination game. Why? It seems like you cause your own demise. I mean it’s your “Drink me!” pile after all. It’s not other characters’ fault if you can’t handle the drinks at the Inn or gamble away all your hard fought gold! Drink cards give the game that little nudge of mayhem. They’re not all detrimental. Some may actually improve your stats: Holy Water, coffee and the like. Then there are the really nasty beverages like Dragon Breath Ale or Orcish Rotgut (cough cough!). Trouble is they get played on your character’s “Drink Me!” pile, so you never really know what might be in store. The real fun happens when a Drink Event is turned up. These Drink cards affect all the players at once and can change the game for your or your friend’s character when you least expect it. All in all, a healthy mix of card combos, humor, and unique game mechanics make Red Dragon Inn a great 3 or 4 player game. The 2-player game may be a bit too predictable since it will mostly be a tennis match. Even so, with the different character choices, the game will give you quick and comical card-play every time. The game is also is themed perfectly to occur after a your real life RPG game. Choose a character that matches your real life PC, you can even rename the characters after your own, and unwind after a real life campaign in the Red Dragon Inn. Wait there’s more! Check out any or all of these Red Dragon Inn expansions that introduce new characters, new rules and take the mayhem through the roof, up in the sky, bounce it off the moon, back through your roof and onto your game table. Have fun! Take on the role of one of four heroic fantasy adventurers – Dierdre, Fiona, Gerki, or Zot – and enjoy an evening at the Red Dragon Inn! The Red Dragon Inn may be played alone or in combination with other versions of The Red Dragon Inn to allow games of up to 12 players! Red Dragon Inn is a comic game about what the adventures do after they have looted the treasure and returned to the tavern. The goal in Red Dragon Inn is to be the last player still conscious at the bar. Each player will have one of 4 unique decks that represent the adventures. Another deck known as the “drink deck” serves as the drinks the adventures will be consuming over the course of the evening. Each player also has 10 gold and when they run out of gold they are throw out of the tavern for their inability to pay for drinks. Each player also has a track from 0 to 20 and two gems that they place on the track. The red gem is placed at 20 and represents the character’s health and the clear gem starts at zero and represents the character’s alcohol content. If these two ever meet then your character passes out and is thrown out of the tavern also (or carried up to bed if you prefer to be nicer about it). On your turn you’ll discard any cards you want and then draw until you have seven. Cards are divided in to Actions, Sometimes, and Anytime cards. On your turn you may play one Action. The Sometimes cards will tell you when you can play them and the Anytime cards are just anytime. After you have played an Action or passed you will then take the top card of the drink pile and place it face down on any other player’s drink pile. Then you will flip the top card of your drink pile and apply any effects it has (usually gain alcohol content). The game has a fun style and the characters really make the game. Such as the Priestess’s ability to turn wine into water, the Rouge can slip mickeys in peoples drinks, and the Wizard who’s magical pet rabbit can get into all sorts of mischief. Rounds of gambling on cards move the money around and when the drink deck runs out each player must pay the inn to bring more. I really adore this game as the atmosphere it tries to create really comes through. Each time my group plays we are constantly trying to one up each other and flaunt the talents of our characters. The game says it can be played with 2-4 but I highly recommend having four each and every time. The drinks go faster and the money moves a lot more with all the players. Although the play time with four seems to be a bit longer than the 30-60 minutes suggested by the game. I highly recommend this game. It has been a great staple in my collection and creates a good time whenever I pull it out. And if you want more characters and more drinks there have been two or three expansions for the game that each adds four new adventures and a whole new drink deck. With the new expansions you could play more than four people, but be prepared to wait a while for it to come back to your turn. Each character has different strengths & weaknesses, which makes this game great for replay, you can try to learn each character or try to develop an unbeatable strategy for 1 character. The artwork is great & the Card Titles & wording are full of character. People will often end up taking on the personality traits during the game of the Character they are playing. Does not require any special knowledge of Role Playing Games or or Drinking or Gambling. If you are an Expert Gambler playing as a character who does not have gambling cards it will not help you any. Do not discount the discard phase, when in a pinch you NEED Gold/Fortitude you can discard your entire hand in hopes that your new 7 cards will help you to stay in the game. My group enjoys the premise of this game. Still, we rarely play it. Why? Because after a few rounds, we pretty much hate each other’s guts. This is one of those games where you just utterly screw each other over. Horribly. All characters are great at some things and horrid at others and once you figure it out, you know who to harass. Based on who’s picked, usually one person is completely doomed, unless you’re in even numbers. It’s fun, and the cards are really funny, but you can’t play this with people who care at all if they win or lose. Quick and easy. Get four people together, four role players is best, and have a great time. I play with my friends all the time and they can’t get enough and neither can I. If you actually take on the role of your chosen character things get much more fun and interesting, although not at all needed. Every character has great a great flavor to them and it really shows the thought that was put into every deck. With more expansions you can get up to 12 people playing, let the hilarity ensue. Tip (Adults only): Drink your drinks, and the game takes on a whole different light. This game highlights a seldom explored aspect of the lives of the heroes/heroines of role playing games…the inevitable bragging and debauchery that follows a successful quest! This is a perfect game to start off an evening of gaming with, particularly roleplaying. While there is certainly no need to get into charachter while playing this game, it is a lot more enjoyable if you do. Also, being semi-scripted by the use of the cards it is a great way to easy neophite gamers into the wonderful world of adventure role playing. With all the current expansions, you can play up to 20! (Which makes gambling much more deadly btw.) Great fun to play as a nightcap for an evening of gaming. Add a Review for "The Red Dragon Inn"